NYPD precinct where most of those arrested went: 212-788-1400. RT @: Everyone at #OccupyWallStreet is #reading and #writing .. it's like an #engaged #education project .. exactly why this is interesting - chaotic network mapping, pen testing, opening new nodes and adding capacity; defragmenting and reconfiguring the network. The network only looks incoherent to those using an incoherent map. RT@ #occupywallstreet has gone from a press blackout to articles saying the protest is unfocused and pointless. That's progress. Reports coming back at 12:00amEDT of arrestees returning - some were fingerprinted, some given appearance tickets and some merely being detained for hours under uncomfortable conditions only to be released with no charges. According to this NY Times report, either the city planners and police are incredibly incompetent and uninformed or people were entrapped in a style I've seen before at various demonstrations over the years. Speakers on the Livemedia stream is confirming there were no plans to occupy the Bridge; merely to march to Brooklyn and One Chase Manhattan Plaza. #occupywallstreet NYTimes Blog is now reporting on NYPD purposefully misleading protesters from legal zone to arrest zone. 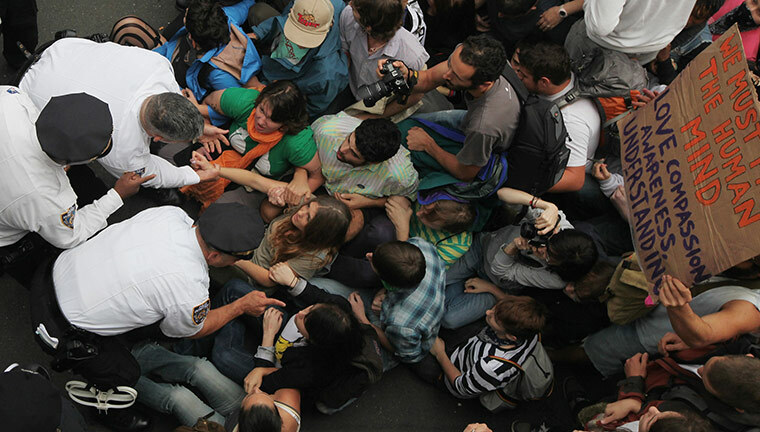 RT @: #occupywallstreet NYPD mislead 400 protesters off legal path into illegal road then arrested them for being there. #occupywallstreet corralled onto Brooklyn Bridge by the police, then media reports that police responded to them 'blocking traffic'. #SetUp. Police explanation for #occupywallstreet arrests: not enough cops on roadway, so couldn’t hold marchers back. This audio report , made to a Democracy Now reporter, seems to confirm deliberate misdirection/entrapment on the part of NYPD, as does this video: Police Leading #OccupyWallStreet Protesters Onto The Brooklyn Bridge Traffic Lane . Many of the released protesters are saying that they thought they were following NYPD directions and steered on to the bridge. Whichever, chaos or deliberation, it was a bad decision on the part of NYPD Tactical to block off both ends of the bridge. If they would have let the protesters go, they would have marched across the bridge to Brooklyn, clearing the bridge in 15-30 minutes and arrested them there. Instead, NYPD turned it into a debacle, tying up the Bridge for hours and blocking vehicular traffic, including ambulances. "Fucked. Up. Did some googling - Colin Moynihan is the East Village community editor for the City Room blog, whereas Al Baker, the second writer whose credit was added to the revised article, is the Times’ police bureau chief. Explains the difference in perspective; one of them wants to tell the real story and the other wants to tell it from the cops’ point of view." "After allowing marchers from the Occupy Wall Street protests to claim theBrooklyn-bound car lanes of the Brooklyn Bridge and get partway across, the police cut themarchers off and arrested dozens of demonstrators." "Robert Stolarik for The New York TimesSome demonstrators that walked from Zuccotti Park in lower Manhattan to the Brooklyn Bridge were arrested on Saturday when they blocked traffic on the Brooklyn-bound lanes." As you can see in the copy I have, Robert Stolarik [Times photographer]'s name was added at some point. It is a mark of the old media meeting the new: whereas OldMedia might hold onto a story until a fact-checker or editor could run through it, NewMedia publishes in realtime, which leads to unreliable informational content from raw data. However, OldMedia is trying to "catch up" to the new media in order to monetize it, and by doing so they make distinguishing between the two information streams difficult (and diminish their importance in the eyes of NewMedia) by not utilizing their traditional strength: fact-checking and error-correction; NewMedia is an inherently-unstable network. It could simply be a case of revision in style and writing and still look like a spin or a slant; newspapers have always been known for their individual liberal, conservative or radical (outsider) characters and have revised a story to an editor or publisher's taste and sentiment; this is nothing new. What's new is that OldMedia doesn't have the time it used to have to polish and present a story in keeping with their editorial platform. It's worth noting that #occupywallstreet is not the first popular reaction to the economic crisis. Remember the Tea Party? This is a dynamic mirror of that one, in terms of the curve that is being expressed: the real data is that there is a huge strata of society, crossing many boundaries, that is very frightened and unhappy at the current state of affairs in this and other countries and is getting restless. The only thing to do in such a situation is try to pick out patterns that keep reverberating or turning up and glean whatever information seems to agree in both streams as an approximation of what is actually happening. This just in: Brooklyn Bridge occupied by #OccupyWallStreet still not big enough news to make @CNN's top stories. I don't like being too political, but while #occupywallstreet protestors have shut-down the BK Bridge @CNN is showing Elmo... seriously. #occupywallstreet Mass arrests on Brooklyn Bridge. WHERE ARE THE NEWS NETWORKS? @CNN @MSNBC @NBCNews @ABC @CBSNews @CNBC DO. YOUR. JOBS. Although this is not precisely true, as evidenced by the links below under Media, what definitely is true is the paltry coverage in US and allied lamestream media as compared to Tea Party protests & international coverage. Yes. RT @jorge_lingo: Seems weird that #BrooklynBridge is a trending topic on Twitter in the U.S. but #OccupyWallStreet isn't. what gives? Someone else overran the Bridge and attacked Police Hall and weren't arrested: 10,000 off-duty police officers. You have to love the internet. In #occupywallstreet we see what "real transparency" looks like, instead of the one-way scrutiny we've been being conditioned to. Is JP Morgan Getting a Good Return on $4.6 Million “Gift” to NYC Police? That trustworthy spokesman Paul J. Browne, deputy commissioner for the NYPD, says "over 700 summonses and desk appearance tickets were issued." Hey, didn't I just use that Dylan reference in Monday's post? Working it out in public: What’s my problem with #OccupyWallStreet? This post seems reasonable, for a minute until it mentions comparison to Tahrir "repellent"; I guess he didn't see the video from Tahrir Square supporting OWS :D Unfortunately, this post blindly refuses to accept the operating premise that the system is compromised. You cannot work on a virus-riddled system; you must reformat it. "You say that our aims and goals are kind-of vague, but I don't believe they are. Look, everybody knows that things are really bad, all around, everywhere: the growing gap in income, the ecological disasters, the collapsing of the economy. Everybody knows this." Indeed; this is the elephant in the room. And one more from the livestream: "People in the group are trying to reach their own positions, but first they're agreeing on their principles." This doctored photo from an "OWS supporter" has given people something to run with - bad idea. This protest doesn't need manufactured propaganda; there's plenty-nuff real stuff out there for use. It only opens an opportunity to discredit. This website details that Photoshopping. And then... there's the website of the guy who actually did the photo for a print (sans the captioning), Scott Lickstein, who says he "released the teaser for this print last week " and openly states that it is a 'shopped print and never intended to be deceptful. The age of the Red-Haired Girl keeps dropping; 13, 12... in an attempt to elicit instinctive fury. No one really knows how old she is at this point. 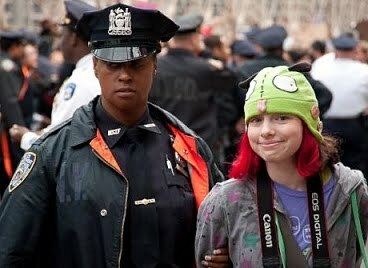 A real irony: NYPD arrested a minor on the 1st day of National Bullying Prevention Month. It would be great if all the "debaters" could learn the difference between false flag, straw man and ad hominem attacks. I see the terms thrown around frequently; it doesn't impress me with their arguments. The astroturfers and sockpuppets have come out in force after the pepper spray/Bologna videos broke out. Most of the attacks can be boiled down to the set I delineated in this post. However, the game is being upped by some seriously nasty implications; these are the pros; the signal disruptors, attempting to introduce fractures into the dialogue and divide the focus. The more "sophisticated" ones keep pushing "focus down to one demand!" as a staple; they cannot deal with a multiplexed mode of communication. They also are trying to maneuver people into "picking a position" so they can assail it. Because when the racists can't protest "the Jews", they can still protest "the bankers" and mean the same damned thing. needs to be denounced as terrorists nowadays, it's not the 50s anymore. A few are even saying... (wait for it)... "comrade". I know :D But they really are. Give a troll 3-4 tweets and they immediately lose all pretense of "reasoned debate" and descend into childish and vicious personal attacks, scatter-shot jabbing for a tender spot; this is a reliable hallmark of the species. After documenting some of my troll interactions I couldn't help but be amused when I got this one: Tea Party wants the same thing. So how are you getting it accomplished down there? after days of watching Tea Partiers/sockpuppets/astroturfers attack OWS and vehemently deny there was any common ground. Here's a snowcone making the rounds: "It's the inequality, stupid," a reference to the well-known slogan of Bill Clinton's 1992 Presidential campaign. Framing the Debate: It makes me ill to think #OccupyWallStreet is somehow the ANTI Tea Party. Does the Tea Party dislike Corporate corruption? Hotfix: I don't know much about the Tea Party's position; this is my own position. Futility Of Your Argument: Why would they cover it. It is a waste of time and irrelevant - like you. Hotfix: Point them to the lamestream media stories. You're Bums: So glad the white privileged #OccupyWallStreet kids don't have to get up and go to work, raise a family, volunteer in their communities. Hotfix: Point them at the pilots, teachers, First Responders, photos, stories. Hotfix: Actually, you're ignoring the stated premise: money has corrupted government. Attack on Rationality: Because their obnoxious professor told them to.....RT @hippojuicefilm: Statistics from #OccupyWallStreet 99% of people do not know why they are there. "Wall Street is like any other machine; it's either a benefit or a hazard.